Leaders: Every member of St. Luke's. Our Congregation's Leadership includes everyone who responds to God's call to love and serve Him, inviting others to celebrate life in Christ. Lexie Langenfeld - Youth rep.
Pictured are: The Rev. Connie Claxton, The Rev. Frank VanDeSteeg, Darcy Valentine, Beth Wanamaker, The Right Rev. 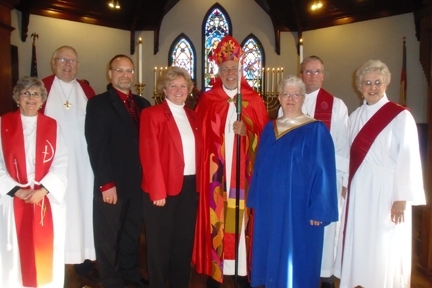 James Jelinek, Lyn VanDeSteeg, The Rev. Bob Langenfeld, The Rev. Betty Herman.